Hearts made it three wins in a row as the Maroons showed signs of making a rapid recovery from a sticky start on and off the field. But it wasn’t until the final whistle sounded at Somerset Park that Hearts could be sure of another two points. What had been expected to be a reasonably trouble-free outing against a newly-promoted side, which had given away 12 goals in their previous two games, turned out to be a rugged and rough 90 minutes. An over-talkative referee, who appeared afraid to exercise his authority and was content to officiate from midfield, spoiled the proceedings and allowed far too many niggling fouls to go unpunished. The Ayr defence was well equipped in physical strength and, when they discovered that the referee was unwilling to be strict, there were those who took advantage of the situation, and, by the time the second half was reached, brawls threatened to develop at any time. The noting of Johnny Hamilton’s name helped to simmer tempers, but it was not until Alan Gordon rose perfectly in the middle of a crowded goalmouth to head home a Hamilton cross, which had been flicked on by Willie Wallace, that Hearts settled to any semblance of their recent form. There was no doubt that the Maroons missed Alan Anderson and Don Kerrigan. The skipper’s (Anderson) drive and leadership would have been invaluable to a defence which never looked completely comfortable. Willie Polland was often caught out trying to be too clever while his slowness on the turn would surely have been exposed by a sharper forward line. Fortunately for Hearts the Ayr attack was simply shocking at close quarters so Polland’s mistakes did not prove costly. Hearts were thankful too that skipper for the day, Jim Cruickshank, hardly made the slightest error. While he did not have much to do in the first half it was a different story for 15 minutes after the interval. During that spell, when Ayr threatened to cause a big upset, Cruickshank defied Sam McMillan and Ian Hawkshaw with splendid saves. 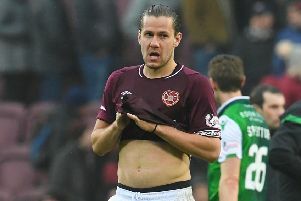 Once Gordon put Hearts ahead it was hard to imagine them losing, although the failure of the forward to accept some good chances in the closing stages meant that the strain was on until the last moment. Ayr: J Millar, R Malone, J Murphy, S Pirie Quinn, E Monan, D Mitchell, J Grant, S McMillan, A Ingram, I Hawkshaw, E Moore. Sub not used: A McAnespie. Hearts: J Cruickshank, C Shevlane, G Peden, G Miller, W Polland, B Higgins, J Hamilton, J Murphy, W Wallace, A Gordon, T Traynor. Sub not used: D Clunie. Referee: Ref: J Stewart (Paisley).